While filming for Counting On, nine of the Duggar siblings (Jana Duggar, John-David Duggar, Jinger Duggar, Joseph Duggar, Josiah Duggar, Joy-Anna Duggar, Jedidiah Duggar, Jeremiah Duggar, and Jason Duggar) perform a unique version of "Happy Birthday" for their sound man, Bill. What do you think? Very unique and well done! Great job everyone! I LOVE this song this way! Beautifully done! Great rendition-it was terrific. When is Jinger getting married? Awesome! What a great bunch of godly young people always thinking up ways to honor and bless others! Keep up the good works Duggars! Love you all, each and everyone of you. I love how the Duggars are kind and thoughtful to everyone. fantastic and what a great way to wish their sound man a happy birthday..
wow! great harmony! way cool! They are amazing!!!! Such good harmony!!! AWESOME!! They sounded incredible!! They are so talented. How could anyone not be moved by having such a beautiful rendition of "Happy Birthday" sung to them? Happy Birthday sound man, and many more to come. Lovely to see (and hear) you! Missing your show (with the whole family) and hoping it will be back on TLC. Ah!!! So good. Love seeing the dynamic of the grown duggar kids without Jim Bob and Michelle around. Dont get me wrong - love the whole family but it's unique and special to see just the siblings. That's a different sound guy that's not Jim who use to so it before. Yeah, but Bill was on their original show too. Bill has been working on the show for a long time. Also wasn't Jim around the age to retire? Sounded great! You Duggars always make me smile, miss you all. It sounds like a slowed down version of "Happy Birthday" from Alvin and the Chipmunks! Bare feet in the woods in the dirt? Thanks for hanging in with the family no matter what all those years. The video names Jinger as "Jingle"!!!! Jinger is Jingle in the video and Jeremiah is Jeer instead of maybe Jere. That is probably Bills nickname for them. Where is Jim and Happy Birthday Bill,Beautiful sound! If this were the 1970's if they did not have a reality TV show they could have a family show based on performing their own talents. Just thinking about the cute little Bates baby that just was born. Well, they're not the Von Trapps are they? That was quite charming and sweet. Good to see them all having fun! I didn't even recognize Jeremiah with his short haircut, he has grown up a lot! This is awesome! 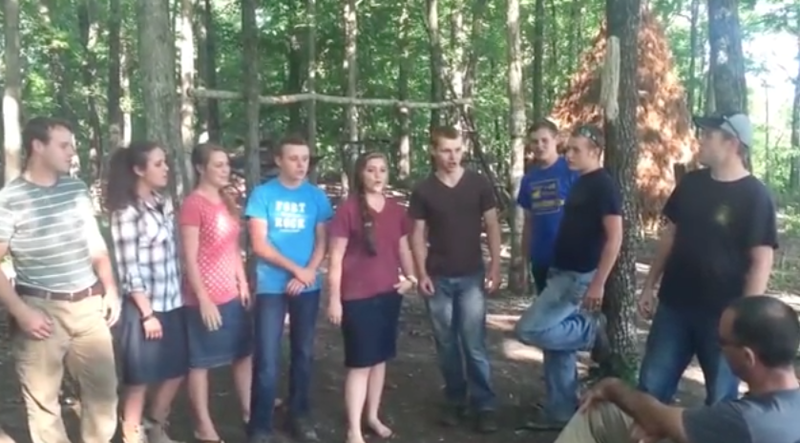 Hope to see more barbershop style and acapella songs from the duggar kids; I love it! Awe, they did an AWESOME job! That was really good! Way to go Duggar kids! I thought it was Scott Enlow. Their harmonies are great! LOVE this family!!! Great job singing!!! I noticed, again, its only the Duggars who are "of age" doing Counting On this season. None of the younger kids filming I presume? Coo! I'd like to know where Jim the sound man is? Still working? Retired? That was so special, enjoyed it!